This is our 8th Annual Jingle Bell 5K / 10K and Kids Dash to Santa. A huge event each year with lots of fun and holiday spirit ! We had 80+ Dashers to Santa last year and he was thrilled. Kids Dash for Free with an Adult Race Registration. Your Pre-Registration packet will be ready on Race Day at the Pre-Registration table.... in a Christmas Stocking we hope you will enjoy! You bring the Santa Hat or your Favorite Holiday attire ! We'll have the Bells for your Running Shoes !! Custom Medals for ALL Finishers Plus Place Medals for 1st through 3rd Place in 5-year age brackets - Plaques for the Overall Male and Female winners and for our Centurion Divisions - M&F 49&Under and 50&Over. 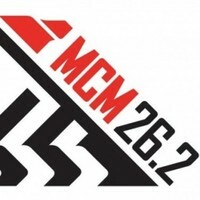 The race will be on a closed course, beginning at the San Pablo Dam boat launch ramp, at the San Pablo Reservoir located at the Orinda entrance (not the El Sobrante entrance) to the Reservoir. No cars will be allowed into the Reservoir after 8:40 am, the gates will be CLOSED and will not reopen until 9:45 for the safety of our runners. Remember, 10K starts at 8:30 and 5K at 8:35, so you won't be inconvenienced by the gate closure. 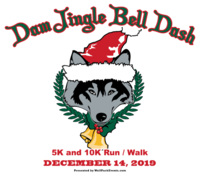 We'll have lots of Holiday Spirit, Santa to award the Kid Dashers, your race packet in a Holiday Stocking, Bells so you can Jingle All the Way, Holiday Treats for adults and kids alike, and Carolers to sing us into the Spirit of the Holidays! Hope you'll join us for a very Merry Event!! If you missed online Registration, come to the race. We open at 7:00 am... Saturday... Same Price ! The race will begin at 8:30 am and take place on the scenic old San Pablo Dam Road and trail. Kids Dash will be at 10:30 when Mom and Dad are back from their 5K/10K. From Orinda (Hwy 24) go west 2.4 miles on Camino Pablo; turn right at the San Pablo Reservoir Boat Launch (Old San Pablo Dam Road) and follow the service road 1.5 miles to parking lots. From I-80 take San Pablo Dam Road Exit; East 8.9 miles on San Pablo Dam road (to the 2nd entrance, close to Orinda, not El Sobrante). Turn left at San Pablo Reservior Boat Launch (Old San Pablo Dam rd.) and follow the service road 1.5 miles to parking lots.